Sunna, or Sol, is the Norse goddess of the Sun. We derive the English word ’Sun’ from her name and Sunday is named for her. She is known to drive her Chariot across the sky, pursued by the wolf Skoll, who seeks to devour her. It is said that sometimes he comes so close that he is able to take a bite out of the Sun, causing an eclipse. She has been called All-Bright, Everglow, and Fair Wheel. Her Sun Chariot is drawn by two golden horses, Allsvinn (All-Swift), and Arvaker (Early-Waker), who pull the sun behind them. Its heat would be too much for them, except that Odin created a talisman called the Isarnkol, which hangs above their shoulders on the double yoke and constantly spreads cool mists, protecting them from heatstroke. As Sunna, She is a healer. She is known for her life-giving Blessings and can be asked for victory blessings. 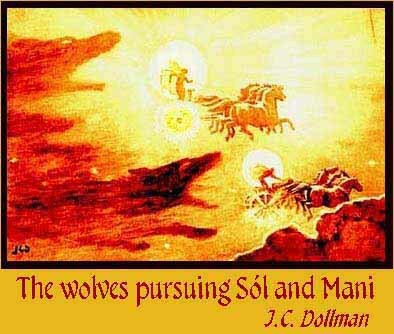 At Ragnarok, the foretold “Twilight of the Gods” or end of the world, it is believed the Sun will finally be swallowed by Skoll. When the world is destroyed, a new world shall be born, a world of peace and love, and the Sun’s bright daughter shall outshine Her mother. But until then, we may bask in her beautiful rays.